Today I went to the market with an idea I’ll buy some fresh sardines, throw them in some flour and then fry them in oil. But life, unpredictable as it may be, interfered and there were no sardines available. Since I was on a budget and couldn’t buy more expensive fish, I went with my guts and bought Atlantic horse mackerel which is a really cheap and solid fish. It congregates in large schools in coastal waters, where it feeds on crustaceans, squid, and other fishes. The two main populations are the west stock which spawns in the eastern Atlantic off the coasts of western Europe, and the north stock which spawns in the North Sea. 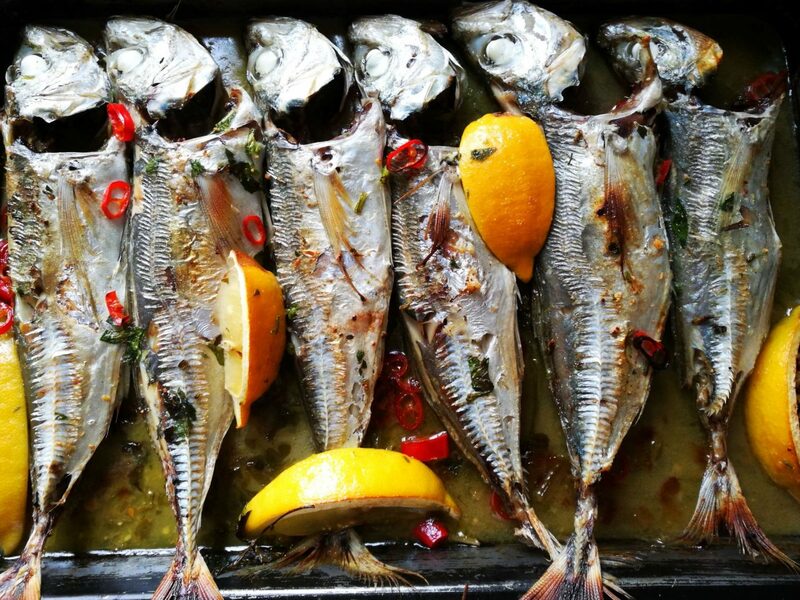 This mackerel is edible and can be smoked, fried, salted, and baked. It is an important commercial fish. It’s not a very popular fish, but it doesn’t mean it isn’t tasty, actually if prepared well I prefer it to sea bass. It has fine, solid white meat, and the only problem (to some) is that it’s quite bony. But if you’re an experienced fish eater, you should be fine. In case you didn’t ask your fishmonger to do it, clean the fish from gut. Rinse well and dry. 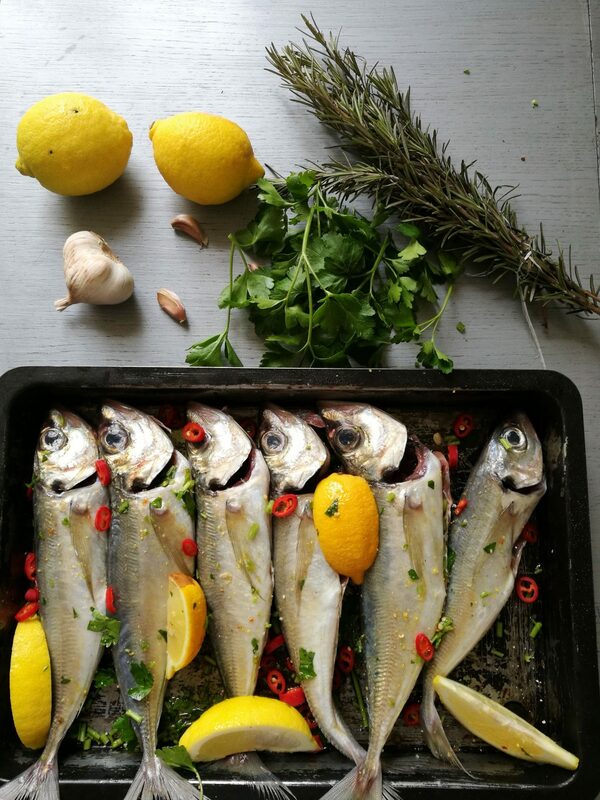 Put the fish in a tray, sprinkle with salt and garlic power and add olive oil. Chop up the chili and parsley stalks and add to fish. Pour over with white wine, add pieces of butter and wedges of lemon. Cover with tin foil and put in a oven for 20 minutes. Then put your oven to grill, increase the temperature to 250 and bake for 10 more minutes. 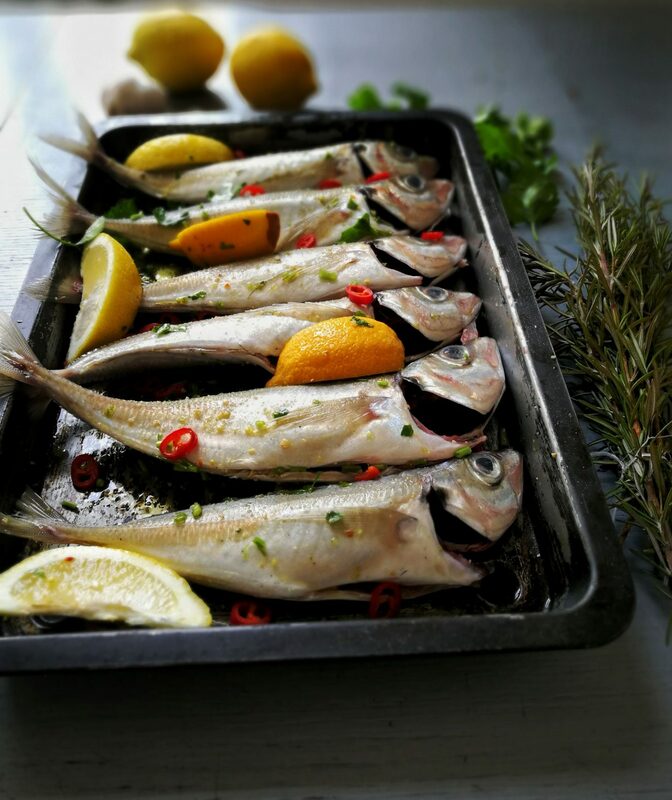 Serve with a good loaf of home made bread, boiled potatoes or a lot of salad. Whatever you do, do not waste the juice, it’s an incredible dipping sauce.